Excited about Charles Coe’s new volume of poetry”Memento Mori” coming out on April 15th, 2019 and proud to have a photograph of my work by Gordon Webster on its cover. Charles was working on the collection while we were both Boston Artists-in-Residence and at least one of the poems in particular bears upon those experiences! Looking forward to getting my copy! 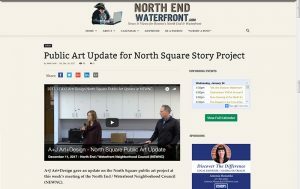 A+J Art+Design gave an update on the North Square public art project at this week’s meeting of the North End / Waterfront Neighborhood Council (NEWNC). 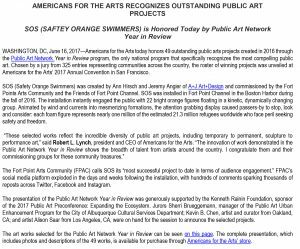 SOS (Safety Orange Swimmers) was chosen to be Featured Project and Top 20 Public Vote Finalist for ArtPrize9 in Grand Rapids, MI from September 20 – October 8, 2017. 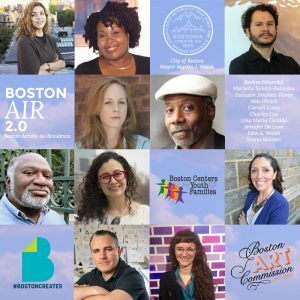 Mayor Martin J. Walsh, the Mayor’s Office of Arts and Culture, Boston Centers for Youth & Families, and the Boston Art Commission today announced the successful completion of projects created by the 10 artists selected for the City of Boston’s artist-in-residence program, Boston AIR. These projects represent varying arts disciplines, from printmaking to sculpting and more, and builds on the Mayor’s commitment to implementing Boston Creates, the City’s cultural plan. 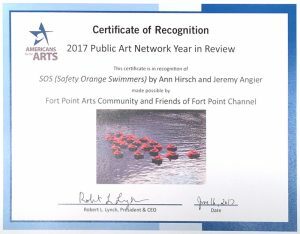 SOS (Safety Orange Swimmers) was honored by program. Public Art Network which is the only national program that specifically recognizes the most compelling public art. More information. 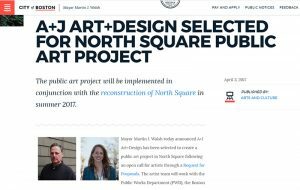 Ann Hirsch and Jeremy Angier of A+J Art+Design are honored to have been selected to create a public art project in Boston’s oldest public square, North Square.Their concept was selected through a highly competitive open call for artists. 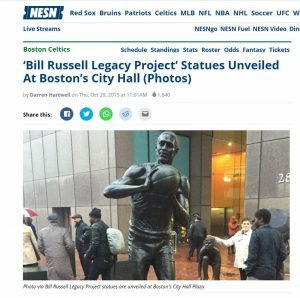 The team will work with the Boston Public Works Department (PWD), the Boston Art Commission, and the North End community to further develop their initial proposal. The public art project will be implemented in conjunction with an overall reconstruction project in North Square. The project will be installed in 2018. Mayor Marty Walsh announced in a statement earlier this week that 10 locals have been chosen for the nine-month residency supported by Boston AIR. The artists will help develop ways to improve Boston by promoting the presence of art and culture in everyday life. Ann named a 2016-2017 Boston Artist-in-Residence! 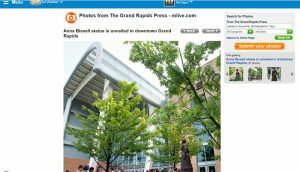 A crowd gathers after the unveiling of a 7-foot statue of Anna Bissell outside DeVos Place in downtown Grand Rapids on Thursday, July 21, 2016. Bissell was a 19th century Grand Rapids business leader.